Serena Brasserie, Intercontinental Kuala Lumpur: Discover Korea’s Delicious Secrets! A Taste of Hansik in the Heart of the City! Ahnyeong Haseyo… if you don’t know Korean, you would have still at least heard about this Korean greeting! One of my favorite cuisines is Korean cuisine, Hansik. 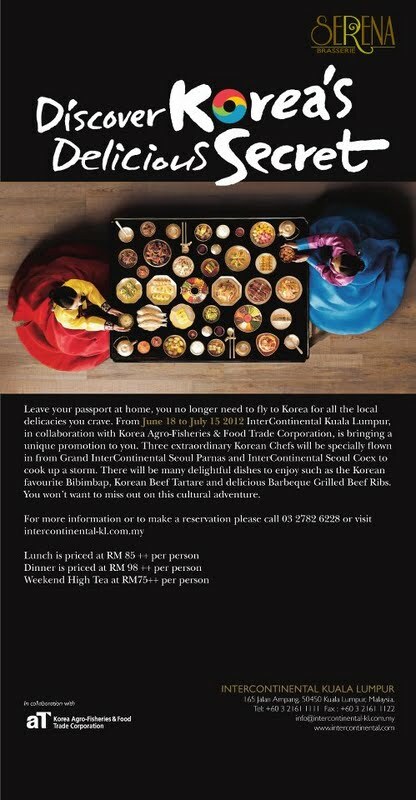 From June to July, InterContinental Kuala Lumpur is collaborating with Korea Angro-Fisheries & Food Trade Corportation to bring a cultural promotion to guests featuring The Korean Feast at Serena Brasserie. Serena Brasserie is proud to welcome three distinguished Korean Chefs from Grand InterContinental Seoul Parnas and InterContinental Seoul Coex and their list of authentic Korean dishes. Lead by Master Chef Kim Jae Sun together with Chef Hyun Soon Ahn and Chef Jun-Young Heo, the chefs have prepared an exciting menu that focuses on staying true to the characteristics of authentic Korean cuisine. The Korean Feast features over 20 Korean dishes per night with some in rotation on daily basis. ‘There is nothing quite like Korean food made with fresh Korean ingredients from the season at hand!’ quoted Master Chef Kim Jae Sun. Besides the most common spicy red Kim Chi, other Banchans included are Nabak Kim Chi (Water Kim Chi) and Beoseot-Namul (Assorted Mushroom), Kkakdugi (Radish Kim Chi), Oi-Sobagi (Stuffed Cucumber Kim Chi) and more. I had a bit of everything with the grilled meats which was a myriad of flavors and textures that complement each beautifully. Seo-Galbigui (Grilled Beef Ribs) hot off the grill was aromatic and juicy. A little sweet, probably from the fruit marinade, and savory from soy sauce, the tender beef was a favorite among guests. Koreans do enjoy a variety of raw dishes and one of the unusual one is Yukjoe (Korean Beef Tartare). Similar to the French Beef Tartare, this one had julienned fresh beef marinated and served with raw egg yolk and fresh pears. A hint of sourness with sweetness balanced up the raw beef neatly. Undeniably delicious, Haemul-Pajeon (Green Onion and Seafood Pancake) was freshly fried and served hot. Two variations from the regular pancake and a spicy Kim Chi version were crisp on the outside and soft inside filled with bits of seafood. A famous Korean soup said to be armed with loads of healing properties and health benefits is Samgyetang (Ginseng Chicken Soup). A whole young chicken is literally stuffed with ginseng, red dates or jujube and rice is simmered gently in an earthen ware till the soup is bursting with loads of goodness. Another ingenious idea to downsize the special chicken to boneless rolls! Other soup offerings are Sundubu Jjigae (Clams and Bean Curd Soup) and Deenjang-Jjigae (Bean Paste Soup). Bulgogi, Korean’s favorite meat dish, was also available together with Haemul Jjim (Steamed Assorted Seafood) and Japchae (Stir Fried Potato Noodles with Fresh Vegetables). Sweet and flavorful, the tender grilled beef was a delight with a bowl of piping hot rice! Spicy seafood from the Haemul Jjim balanced up nicely with the chewy Japchae. Other dishes available on rotation basis were b (Stir Fried Baby Octopus) and Saengseon Jeon (Pan Fried Fish Fillet). Korean Hot Noodles allow guests to be adventurous and dressed their own noodles! Korean desserts tend to be on a sweeter side with their dessert soups, rice cakes and cookies. I personally loved the Sujeonggwa, a punch made from dried persimmons and cinnamon, served with chilled with pine nuts, despite it’s over sweetness. Sikhye (Rice Punch) is also available together with Korean Cookies. Feeling adventurous? Check out the Korean rice wine called Makgeolli, a liquor rich in lactobacilli and dietary fiber. Made from fermenting grains, the rice liquor is quite strong and can be jazzed up with fruit juice for easier consumption. I like the Apple Makgeolli while the Raspberry Makgeolli was a bit less smooth on my taste bud. For those who still need little familiar dishes, there are plenty of delectable fare such as Grilled Lamb, Satay, Pizza, Cold Appetizers, Salads, Seafood on Ice, Local dishes and curries, and more. There is a Japanese Sushi and Sashimi station and a Noodle and Rice station as well. Desserts were a glorious spread of dainty cakes, tarts, mousse, puddings, éclairs, and even pretty coconut macaroons. Let’s not forget the essential Chocolate Fountain! *Read about my first visit to Serena Brasserie here. A Five-Course Meal with Santa Ana Wine from the Vineyards of Mendoza, Argentina at Senja! Returning to Senja, The Saujana Hotel Kuala Lumpur, to attend a wine pairing dinner with Santa Ana was indeed a memorable evening. My second visit after my previous MIGF 2011 at Senja, the urge to contain my excitement was untamable! Senja’s Head Chef Filippo Giunta has specially concocted a five-course dinner with carefully selected Santa Ana wines to match the feel and taste of every meal creating memories for his sophisticated diners. Senja boast of scenic beauty of serenity. Built on stilts above a beautiful lake, the restaurant is simply perfect for a romantic dinner or business dinner with its gorgeous namesake environment. One can enjoy the sun as it falls into the evening while overlooking the lush greenery of the golf course and fountained lake. The ambience was truly set in style with a classy edge. Dim lights, pristine white table clothes and elegant table setting were some pieces that added the aura at Senja. Lots of glass panel along the walls let nature’s lights gently streamed into the restaurant for a truly amorousness mood. A live four-piece band set the mood even further with soft crooning of jazz that evening. With over 115 years of history in the art of winemaking, Bodegas Santa Ana, an Argentinian wine planted its roots in Mendoza, Argentina. The vineyards there are blessed with a region ideal for the development of viticulture from the watered melting snow from the Andes Mountains, the Cuyo region. Mendoza and San Juan reaped in quality grapes with its cold and dry weather in the winter and warm sunny summer with cool nights. Placing customers’ preferred taste as priority, Bodegas Santa Ana’ innovation and cutting edge skills in adapting to their customers’ needs can be found in an abundance of testimonies. The evening kicked off with canapés and the first white of the Bodegas Santa Ana range where guests mingles comfortably on the restaurant patio while the sun sets. Canapés of Smoked Norwegian Salmon with Horseradish Cream, Prawns with Chutney of Mango and Pistachio and Bruschetta of Wild Mushrooms, Gorgonzola and Chives were beautifully paired with a fine Santa Ana Chardonnay Reserve. The flavors of the canapés melded beautifully among salty, sweet, spicy, and tangy with the crisp Chardonnay. My first sip of the Santa Ana Chardonnay Reserve reaffirmed that I was not in a dream but rather living my life like royalty! Crisp, fresh and scented with citrus aroma, the chilled Chardonnay was my favorite white that evening! We proceeded inside to the gorgeous restaurant and the pre-dinner event was graced by a speech from Bodegas Santa Ana Ambassador. Our appetizer of Burratina Cheese from Andria with Tartare of Tomato, Rocket and Parmesan Dressing had me oozing with delight! Educated by Chef Fillippo, Burratina is the crème of the crop made with buffalo milk. Spun dough of buffalo mozzarella holds a rich buttery filling made from shredded pieces of mozzarella and fresh cream or butter. Imported from Andria, this cheese is deemed a finer quality that the infamous Burrata or buffalo mozzarella. The rich and silky creamy center of Burratina was an eroticism of gastronomic cuisine. Soft and melt-in-the-mouth, the luxurious cheese was light in flavors and jazzed up by tangy tomato, slight crisp and bitter rocket and salty parmesan. I adored the dish for its simplicity that showcased fresh ingredients and its natural flavors! Our second white was La Mascota Chardonnay, a crisp and complex white with aromas of tropical fruits, lingers with a delicious aftertaste! Its flavors were refreshing to lighten the rich and creamy Burratina cheese. Duck Confit Ravioli with Red Onion and Rosemary Sauce followed pursuit as the next course. Shredded duck stuffed into thin pasta dough were glammed up with a rich onion and rosemary sauce. Plush but not overly heavy! The fusion pasta was complemented by a savory, fresh and fruity Santa Ana Malbec Reserve. An intense red, the wine was a burst of berries and plums undertone. A huge beef fanatic, the Grilled Striploin of Australian Black Angus with Radicchio cooked with Red Wine and Potato Timbale was opulent. Mine was cooked medium to my liking and the steak was juicy and bursting with flavors. Warm wilted radicchio stained with red wine was delicious with a soft hint of bitterness while the potato timbale was layers after layers of soft starchy and creamy potato. Yum! The lush beef paired up well with two reds. A La Mascota Cabernet Sauvignon and a Unanime allowed us to enjoy the various flavors paired up with the steak. Cabernet Sauvignon tasted full and had a slight berry and licorice aroma. Unanime was my favorite red of the night. A beautiful blend of Cabernet Sauvignon, Malbec and Cabernet Franc, the red wine had a stronger but very well balance flavors. Meat was a perfect match with Unanime! Every meal had to end and this time it ended classically with a Lemon Cheese Cake with Mixed Berries Marmalade and Fresh Mint. Lemon scented cheese cake was decently rich and lighten up with a refreshing berry jam. Paired with Amarula, an African cream liqueur made from the fruit of an African marula tree, the creamy caramel liqueur was served on the rocks. Flavors resembled slightly towards the infamous Bailey Irish Cream and I enjoyed this a lot as it complemented the cheese cake really well. Head Chef Filippo Giunta certainly has more to offer than the above. Serving an array of luscious Italian cuisine with a twist, one will be please to enjoy an opulent evening of fabulous food coupled with a gorgeous ambience! Samsung Galaxy SIII, The New Olympian Smartphone!